PFB-166. 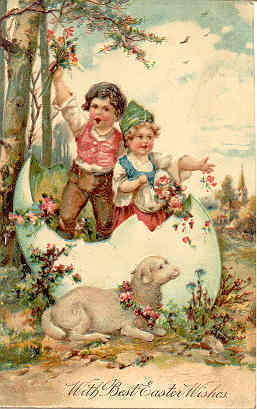 An Excellent German Post Card vintage 1908 with an embossed surface and excellent rich coloring. Published by Paul Frankenfurth of Berlin it is from series 7506, card 2, and can be found in the Ed McAllister PFB Guide of 1978. Card has a DB-USD-PM 1908 with writing on front and in Excellent condition. Buyer pays 1.95 S H for U.S. delivery via 1st Class Mail. FOREIGN and all other addresses pays 3.95 S H for 1st Class Mail I'ntl Delivery. Discounted S H is available for multiple Post Card purchases as follows; 1st two cards shipped for 1.95 with a .25 cent fee for each additional card, and all cards must be shipped together at the same time. Insurance is the responsibility of the Buyer as all cards are well packaged and I will not be responsible for damage or loss once the card has been shipped. I accept payment by Cashiers Check, Money Order, Personal Check, or Cash. I DO NOT ACCEPT PAY PAL or any Credit Card payments. Cash payments must be in U.S. currency and are remitted at the SOLE risk of the Buyer.